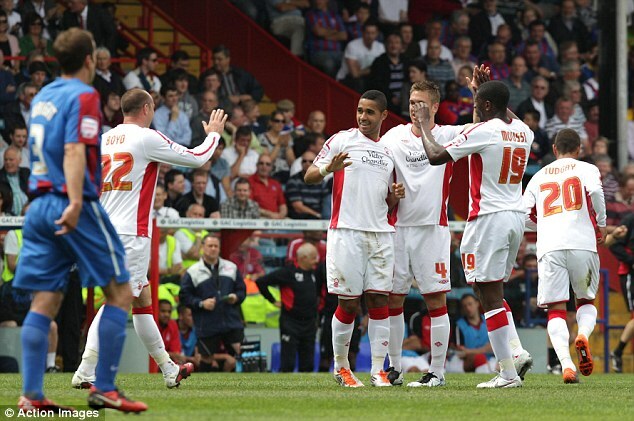 08 | May | 2011 | Through the seasons before us..
Reds brush aside Palace and look to the play-offs.. The Reds (well, Whites) celebrate Lewis' opener..
A nice finish to the regulation season for Forest saw them run out comfortable winners at Selhurst Park and cement their place in the play-offs. Whilst Leeds did come from behind to beat QPR at Loftus Road, their one-goal lead would mean that Palace would have ultimately needed to put eight past us to let them supplant us. Even taking Campy off at the end wasn’t likely to result in that! With the QPR hearing over and no points deductions applied, it’s now appropriate to offer them congratulations on securing the title and promotion – whilst I don’t think we saw the best of them in either of our games, they’ve been up there all season and deserve tremendous credit. As do Norwich who make up the remainder of the automatic places. Back to our game though, Billy made a few changes – Moloney came in for loan-ended Konchesky, who was present at the game to cheer the lads on – nice touch. He slotted in at right back with Gunts moving to left back. Tudgay replaced the suspended Earnshaw up front. Anderson came in for McGoldrick and Moussi replaced McKenna in midfield. The opening stages of the game were quite scrappy, both sides losing possession all too readily – but we were quickly cheered by news filtering through from across London that QPR had taken a ridiculously early lead against Leeds. The most interesting thing early doors in the game I noticed was how quick Palace’s right back looked! Our first chance came from our first corner of the game – a decent delivery from McGugan found Chambers who planted his header into the ground, it rebounded, hit a defender on the line then the crossbar. Chambers tried the same trick as against Scunny by celebrating, but – much like the ‘goal’ against Scunny – I don’t think it had crossed the line. Shortly after the ball broke for McGugan on the edge of the area who caught it with a slightly awkward volley, but powerful though his effort was it was wide of the post with Speroni looking like he had it covered to me. Another attempt, this time from Ando after good work from the number 7, but alas he ended up on his left foot and let fly with a weak shot straight at the Palace ‘keeper. Forest did score soon after though – a direct ball into the box found Tudgay being challenged by a Palace defender – I’m not sure whose head it came off, but it dropped nicely for Lewis who fired it into the ground, bouncing it awkwardly and into the bottom corner of the net. As you often see with Lewis, never quite sure whether or not he meant it to do that. Moments later we thought it was two nil, some lovely one-touch passing culminated in a Cohen cross to Boyd who netted with his head, but alas Cohen was judged to be offside. After this Palace were reduced to ten men, Dean Moxey unleashed what (having seen replays) was a bloody awful challenge on Marcus Tudgay, bringing his studs down onto his upper leg. Tuds got up and then hit the deck again – the jury’s out for me, I think he over-reacted a tad (with the hands-over-face stuff), but it was definitely a red card – and a little silly in a game that had no consequence for Palace. As the first half played out the Reds looked composed and in control of the match, as our hosts adjusted to playing with ten men. There really wasn’t much incident, although I was texted that at one point we’d had 67% possession according to the Sky Sports statisticians – that’s pretty impressive, and certainly we did seem to have the lion’s share of the ball. The second half started more evenly, again the Reds seemed to be in ‘give the ball way’ mode. Moussi did well to get on the end of a Darren Ambrose freekick to concede a corner early in the half, before the Reds were eventually able to get back on the offensive. A decent cross in from Ando found Boyd who shot into McCarthy, the ball falling kindly for Speroni to gather up. It was end to end though, Neil Danns had a chance at the other end but put it wide. Billy opted to make a change, taking off Guy Moussi who apparently suffered a calf issue and had ice put on it straight away. To replace him was Paul McKenna. In the meantime Palace were still threatening, McCarthy heading wide from a long ball. David McGoldrick was introduced for Kris Boyd with 69 minutes on the clock. On the seventy minute mark came goal number two – a lovely cross in by Brendan Moloney in space on the right swung outwards, and found Marcus Tudgay in the six yard box between the central defenders and free to head the ball past Speroni. After scoring he made a beeline for the you right back to acknowledge his part in the goal, which is always good to see. Then came a surprise, Lee Camp was withdrawn having picked up an ankle injury giving Karl Darlow an unexpected debut. Camp was immediately on the bench and with an icepack on his ankle – having received a great ovation as you’d expect from the travelling Reds fans. That said though, he was still off the seat and jumping up and down when we scored the third. So, the third – Chambers passes the ball to McGoldrick pretty far out, he turns, has a look and unleashes an absolute piledriver into the roof of the net. It was the kind of goal we’re used to seeing from McGugan – great to see him netting too. At the other end Gunts picked up a yellow card for a foul, and Ambrose hit the resulting freekick goalward which Darlow dealt with well. Post-match it was great to see the Palace fans give our lads a bit of an ovation (Tudgay aside, who they’d been giving dog’s abuse all game for what I guess they thought was a bit of gamesmanship in the red card incident). All in all, though, it was a lovely gesture from fans out to have a good day having secured their future in the Championship the week before. Elsewhere Swansea beat Sheffield United 4-0, whilst Cardiff only managed a draw at Burnley, which gave the more palatable Welsh side in our league third place – and a play-off tie with us. I have to admit, I would have preferred to face the Bluebirds in the semi-finals, however, I’m thrilled to have made it into the top six and – let’s face it – if we are to triumph, then we must face good teams. It’s inevitable. Brendan Rodgers – a manager I am full of admiration for – has already tried to cast his excellent Swansea City side as underdogs. I would disagree most strongly with him, as I’m sure he does too away from the media. I think for the first time Forest are actually probably being considered underdogs in a playoff semi-final, and hopefully this role suits us better. Our play-off campaign kicks off at The City Ground on Thursday, tickets are already on sale – season ticket holders have ’til 8pm tomorrow to claim their seats, then there’s the priority of NFFC members, bizarrely people who went to the discounted Scunthorpe game, and then it will be general sale. So all that remains is to offer massive congratulations to Billy and the boys, two consecutive play-off campaigns isn’t to be sniffed at regardless of the outcome. Being the typically cautious and pessimistic sod that I am, I struggle to feel too confident just yet, but it’s fantastic to be in the mix at this stage of the season and see what Billy has up his sleeve to hopefully reverse our fortunes in this end of season lottery. As Billy said post-match, it’s definitely time for the boys to come of age.